Let’s go back, way back, to 1969, a time of Vietnam War draft dodgers, the emergence of contemporary feminism, astronauts landing on the moon, hippie-driven free love, and the crumbling façade of domestic bliss. Janet Wilson Meets the Queen shows us these issues and more in a darkly comic coming of age tale that will have you questioning your own politics from start to finish. The drama surrounds a quiet Canadian household: middle-aged mother eagerly preparing for Her Royal Majesty’s visit, live-in grandmother gleefully complaining about the many unwanted changes in her life, aspiring go-go dancer pre-teen daughter caught up in the day’s popular culture, and neglectful husband more concerned with television than his own family. When Janet’s young nephew pops by for an extended stay at the last minute, the Wilson residence is turned upside down for better or worse. Tony Adams is marvelous in his GCTC debut as this long-haired cousin, the carefree stoner with a secret. In one particular scene, he acts upon his sexually liberated urges in a shocking, disturbing manner that really caught my attention. There’s a lot of power and vulnerability mixed up in this character and Adams delivers that balance well. Beverley Wolfe is also delightful as the surly, spirited grandmother with a heart of gold and a tongue of whips. By the end of the play the grandmother’s grasp on reality has faded a little, the daughter has grown up into a bra-burning womyn’s rights activist, the husband’s absences have been explained by a marital crisis, Janet turns to self-medication as her dreams go up in flames, and the mellow cousin is out of the picture – or is he? Plus we have several visits from a mysterious but intensely cool astronaut, also played by Adams. What this astronaut represents was never clear to me but that didn’t detract from my enjoyment of his presence. The transformations each character go through and how they affect one another is captivating, particularly as we see Janet being overwhelmed by all these changes. I found myself rooting for her and wanting to scream: “She just wants a nice visit from The Queen, is that really asking so much?! ?” It’s hard not to get bogged down with the weight of the profound societal changes going on around Janet and in this sense Beverley Cooper has created an effective period piece. What makes the show sparkle is its design work: the costumes are wonderfully evocative and groovy – I especially loved the paisley bell bottom jeans. 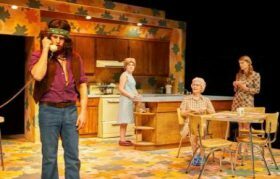 The set is cleverly constructed as a functional, kitschy kitchen with an elevated platform on either side that shows other areas of the house. The central panel where the astronaut initially lives is really cool. I loved how everything came together to build a believable, interesting world for these complex characters. But that’s just my opinion and I’d love to know what you think. Were you around in the 1960s? If so, did this show ring true to your memories? If not, did it still have relevance today? Join the discussion and tell me what you think in the comments below. Janet Wilson Meets the Queen is presented by The Great Canadian Theatre Company. It runs now through May 8th at the GCTC. Visit their show page for performance times and to purchase tickets.